In 2016, two gay bars became national monuments, one in the early hours of June the 12th in Orlando, Florida. The way we learned of the attack through news and social media, and the stories that emerged in the aftermath, dramatized the degree to which LGBTQ social life and social media are deeply enmeshed, and the divisions and exclusions within the LGBTQ community. In particular, the first 24 hours of the attack revealed the divisions between English-language media and LGBTQ people and queers who are Latinx. In the aftermath of the massacre at Orlando’s Pulse nightclub, national mainstream publications featured an extraordinary outpouring of pieces on gay bars and clubs. Mathew Rodriguez linked the tragedy in Florida to the symbolic origin of the LGBT rights movement in New York City, saying, “Like the Stonewall Inn, Pulse now serves as a brick-and-mortar monument to queer resilience.” Thus, the histories of two monuments became enmeshed in a contemporary question: what is the meaning and purpose of gay places? The contemporaneous accounts on social media, and the reaction pieces in mainstream media, reveal how enmeshed queer lives are with both physical places and virtual spaces. President Obama’s response to the massacre framed gay nightlife in terms of the First Amendment guarantees of freedom of speech and freedom of association, describing Pulse as “more than a nightclub— it is a place of solidarity and empowerment where people have come together to raise awareness, to speak their minds, and to advocate for their civil rights.” Taken together, these descriptions repositioned the horror of the attack not only as an assault on particular brown gay bodies, but as the desecration of a sacred space shared by all Americans, gay and straight. The histories of two monuments became enmeshed in a contemporary question: what is the meaning and purpose of gay places? As a professional gay bar researcher and amateur gay-bar-goer, these breathless descriptions left me discomfited. Gay bars haven’t been the center of gay life for decades, and have been going out of business in record numbers in recent years. By my measurements, about one-third of America’s gay bars have closed since 2008 with few new ones replacing them, adding a dissonant note to descriptions of their centrality to gay life. LGBT journalists have noticed, even if few straight ones have, in stories entitled: “RIP Gay Bars,” “Goodbye to All the Gay Bars,” and “The Gay Bar: Is it Dying?” If bars are our sanctuaries, than the congregation has not had their butts in the pews for a while, perhaps part of what sociologist Amin Ghaziani describes as a shift from gay urban enclaves to suburban “post-gays.” With 49 newly dead, however, June 12th, 2016 was not the time to eulogize gay bars as well. 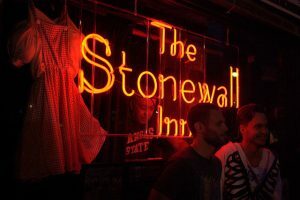 The post-Orlando effusions predictably noted the importance of the Stonewall Inn, an icon raised to the status of National Monument by President Obama only two weeks after the attacks. Almost always described as the origin of the gay rights movement, sociologists Elizabeth Armstrong and Suzanna Crage have shown that among many other previous gay protests, the commemoration of this particular riot was “an achievement of gay liberation [activism] rather than an account of its origins.” Similarly, few writers noted the centrality of bars in general to shaping America’s gay civil rights movement as we know it. As gay historian John D’Emilio wrote in 1983, “bars proved themselves to be repositories of political consciousness and places from which gay anger erupted.” But D’Emilio also documented the centrism of bar politics, tied as it was to the goodwill of paying patrons and civic authorities. This meant that if gay bars were not reactionary or apolitical, they were also never the centers of queer radicalism. For good or ill, the contemporary centrist, gay bar politics incubated the assimilationist character of contemporary gay politics in America. The Orlando attack was framed by many as another attack on America by an outsider, despite Omar Mateen’s American birth and upbringing: Twitter commenters such as the now-deleted @RaesmaC described him as a “refugee” or “immigrant,” and blamed the attack on accommodating his “uncomfortable feelings.” I shared the growing frustration of my Latinx peers at lack of media coverage about the attack being on Latin Night at Pulse, where many of the victims were actual immigrants and economic refugees. The coverage was a textbook case of the difficulty of asserting a complex media narrative about the attack—at least in English language mainstream media. Gay bars haven’t been the center of gay life for decades, and have been going out of business in record numbers in recent years. Social media and Spanish-language media, however, presented more complex views. 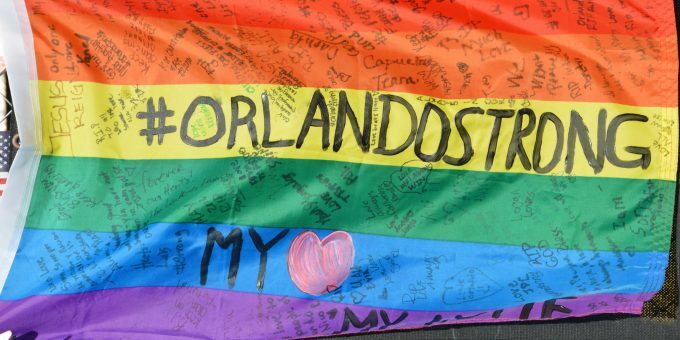 Three hours after the attack, Twitter user Mathew Rodriguez noted the painful juxtaposition of an attack during Immigrant Pride month and LGBT Pride Month. But despite journalists’ reliance on Twitter for their reportage, his insight was not repeated in English-language news, nor were the eerie comments on a Periscope broadcast that presaged the shooting — both issues that were covered in Spanish-language news. The adoption of Pulse as a monument to attacks on America by outsiders, as “our Stonewall” for all LGBTQ people, erases the ways that Latinx queers were themselves outsiders. This is shown in the hundreds of state legislative actions against immigrants, and through bills aimed at LGBT people more generally that are often enforced disproportionately against people of color — attempts to ban transgender people from public restrooms and national proposals to legalize discrimination against LGBT people, to name a few examples. “We” white and cisgendered LGBT people can choose to “be” Orlando in these situations that are less likely to affect us. 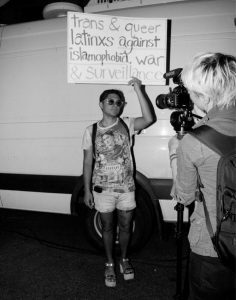 As Vidal-Ortiz reminds us, many Latinx have no choice but to bear the weight of “Queer-Orlando-América,” that place where solidarity cannot erase the inequalities of the surveillance state, transphobia, and xenophobia. The adoption of Pulse as a monument to attacks on America by outsiders, as “our Stonewall” for all LGBTQ people, erases the ways that Latinx queers were themselves outsiders. The promise of LGBTQ places is the possibility of a solidarity across social divisions. If we rarely experience this in person, listening across these divisions on social media is one place to hear a richer chorus of voices, and the meanings of our places, to LGBTQ people—all of us, not just white liberals—in the contemporary United States. Elizabeth A. Armstrong and Suzanna M. Crage. 2006. “Movements and Memory: The Making of the Stonewall Myth.” American Sociological Review 71(5). John D’Emilio. 1992. Making Trouble: Essays On Gay History, Politics, and the University. New York: Routledge. Amin Ghaziani. 2015. There Goes the Gayborhood? Princeton University Press. Greggor Mattson. 2015. “Style and the Value of Gay Nightlife: Homonormative Placemaking in San Francisco.” Urban Studies 52(16). June Thomas. 2011. “The Gay Bar: It’s Riotous Past and Uncertain Future.” Slate Magazine. Salvador Vidal-Ortiz. 2016. “Queer-Orlando-América.” Feminist Reflections. Greggor Mattson is Associate Professor of Sociology and Chair of the Program in Gender, Sexuality, and Feminist Studies at Oberlin College. He is the author of The Cultural Politics of European Prostitution Reform, blogs at GreggorMattson.com and tweets @GreggorMattson.